budget smartphone from global technology leader Xiaomi, sold out within 30 minutes after it was put on sale last April 5 on Shopee, the leading e-commerce platform in Southeast Asia and Taiwan. This made the Redmi 7 the fastest-selling smartphone under ₱6,000 on Shopee Philippines. 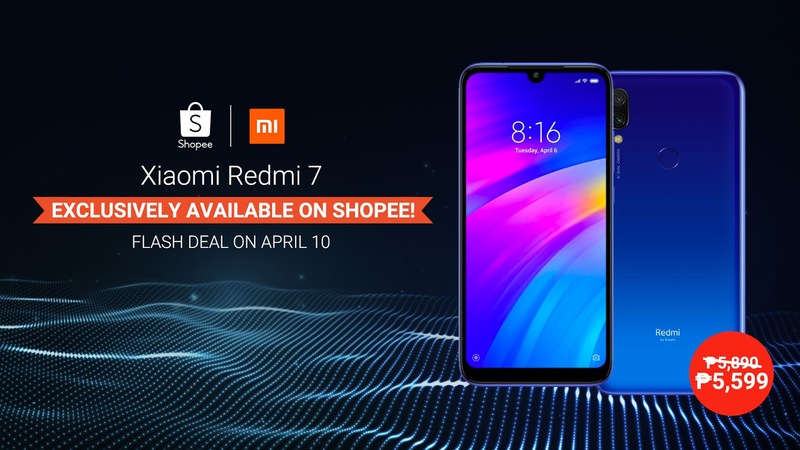 To celebrate the record-breaking feat, Shopee and Xiaomi will once again hold a Flash Deal for the Redmi 7 on April 10 at 2PM. Xiaomi is known for smartphones with amazing features at an affordable price and the Redmi 7 lives up to that standard. Here are seven things you should know about this budget phone with a flagship-level design. The Redmi 7 offers an immersive viewing experience with its Dot Drop design and reduced bezels, that’s all Corning® Gorilla® Glass. The case may be plastic but it feels premium in the hand, especially with its stylish gradient back cover available in Comet Blue and Lunar Red. It runs on the Qualcomm® SnapdragonTM 632 mobile platform and boasts of an Antutu score of 52520, outperforming other phones in its price range. This gives the Redmi 7 support for a smooth gaming experience and makes it great for daily use. The Redmi 7 comes with an IR blaster that turns the phone into a universal remote to control devices and appliances. No need to search the whole house for the remote control, just use the Redmi 7. Selfies can be hard to take, but not with the Redmi 7. Use its Palm Shutter feature to conveniently take pictures. Just flash a palm to the camera, like a high five, and the camera will instantly start a countdown timer perfect for getting selfies or groufies on point. Users should watch out because more gestures will be added soon. With a 4,000 mAh battery, the Redmi 7 can last up to 15 hours of continuous video playback, 26 hours of voice calls and an astounding 412 hours of standby time. Users can also listen to 3,778 tracks continuously on a single charge. Many dual smartphones sport a hybrid sim card tray, where only one slot is dedicated to a sim card, and the other is a hybrid sim card-memory card slot. With the Redmi 7, on the other hand, users can have all three running at the same time with its three card tray - two slots for sim cards and one for the memory card. Perfect for people who want all their contacts and data in one device. Last but not least, the Redmi 7 is available exclusively on Shopee and will go on Flash Deal at 2PM on April 10, where the Comet Blue Redmi 7 with 2GB RAM and 16GB memory will drop its price to ₱5,599, and the Redmi 7 variant with 3GB RAM and 32GB memory will be sold at the lower price of ₱6,299. Visit the Xiaomi official store at https://shopee.ph/xiaomiofficialstoreph.